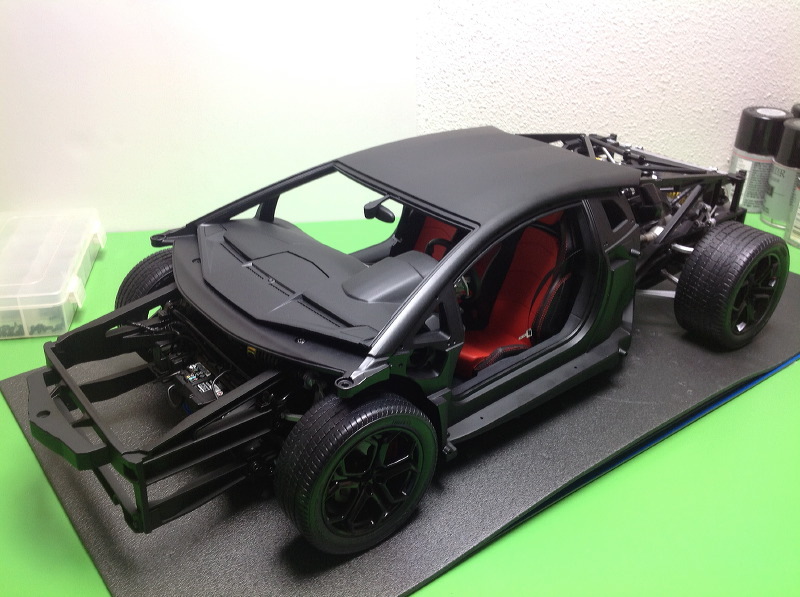 I've been working on Pocher Aventador build with roymattblack's removable body option in mind. I've been documenting my progress here and have gotten as far a rolling chassis. I figured this would be a good time to test fit the rear body, but I ran into a big problem. When I set it in place it would not sit flush with the roof. I could see that it was floating ~1/8 inch above the rear upper frame rails. I agonized over what was wrong for a long time and even went so far as to take the intake manifold apart and remove it because I thought it was in the way. It turns out the culprit is the rear cabin window. The front edge of the metal rear body casting is hitting the window and this prevents it from sitting down all the way. If I were to install the 2 G screws it would pull the body down by distorting the window, but I don't want to install those screws if the body is going to be removable. Has anyone else run into this problem? I suppose I could just remove the window but I'd rather not. I am at a similar stage of building my Orange Aventador and was curious to read your post, so I test fitted my rear body section(K003-01), i found that with the intake manifold assembly in place the two air inlet ducts (parts R-06, R-04 and R-02, R-05)caught on the rear body and had to be moved slightly to get the rear body to fit over and sit down correctly. once this was done, the body sits down correctly, the front edge of the rear body casting is very close to the rear window, but does not touch, and all of the mounting screw hole line up perfectly. I too wreslted with the rear for a good hour as well. But finaly I dod get it on, the rear inlets had to be pressed in to get the body work to fit over them. In my case the front of the casting was in firm contact with the rear window. As I said, you could simply clamp down the casting with screws to deform the window and make it fit, but this won't work for me because I'm not using screws but making the rear removable. I finally took a Dremel grinding wheel to the front of the casting . I had to remove about 1/8" of material, but now it fits perfectly. I am surprised at the variation. All the parts in this loop are cast metal. The main body has the window installed in it directly. The rear upper frame rails are bolted directly to the body, and the rear body sits right on those, so there is really nothing that I could have screwed up to cause the problem. Either something is bent or it is due to variation. In any case, all is well after the grinding, but I was loathe to make such a major modification. When I did my 'removable rear fix' it was all very simple and straightforward. My rear end drops on and lifts off with no effort, no flexing or squeezing of bits or anything. After spending about 4 days on the rear body assembly in Step 25, I was forced to admit defeat and abandon the removable rear body concept. Nothing in this step seems to fit. Besides the grinding that I had to do to remove the interference with the window, the spoiler doesn't sit flush, the engine cover has a big gap in one corner, and the upper side panels (B-03 thru 06) all fit so tight that they buckle upward so they'll need to be trimmed. It would appear that my casting is simply warped to the point that the only way to get it to fit is to pull it up with all the attachment screws. The final straw was when I discovered that the "N" screws which attach the C-02 and 03 panels to the frame could not be installed because the holes were not deep enough. I attempted to tap the hole and broke the tap off in the hole making installation of this screw now impossible. Without the ability to pull up the panel tight against the body, I'll never get the rest to fit. There is a big gap if I just set the casting down onto the side panels (~1/8"). Sigh. I guess there is a lot of variability in the dimensions of the cast parts. I'm glad it worked for you, Roy! I'm sorry to hear you have had such difficulties. Yes, I'd have to conclude that some castings are better than others and you got lucky. I'm at least happy to report that once I made the decision to just screw the body down, it fits reasonably well. There are still some gaps at the rear of the engine cover and engine cover side panels, but not terrible. In lieu of making the engine visible via body removal, I think I may just light the engine bay. The metal engine cover can be bent by hand to eliminate the gap on the right. There is some slop in the hinges that can cause other gaps and interference if they are not tightened. The engine cover should also be closed in two steps because of the tight fit and compound hinges: slide front edge forward, then rear edge down. You may need to press the front edge down as well after closing. More help here and here. It also appears that the plastic side vent covers are warped too. Hence the curved gap running along the top of the rear wheel arch in the last pic. I can only conclude that indeed, I was VERY lucky as every panel fitted really neatly with no awkward gaps. I'm going to try to glue down that curved panel to eliminate the gap. I figure I've got nothing to lose. I was able to reduce the engine cover corner gap by bending it slightly by hand, but it is quite stiff. I also ended up adding some lighting to the engine bay to make it visible and compensate for the fact that I can't remove the body. I have just completed my Roadster and found that if I hinged the rear engine cover(boot lid) it was fitting very poorly. with out the hinges the fit is perfect. Just lifting of the cover gives a better view of the engine any how.